Thank you so much to Ruth Ayres for providing this space for celebrations. I'm finding that focusing on things to celebrate make a world of difference on my outlook on life. Ohio's weather is so very crazy...70 degrees and sunny last weekend, snow on Tuesday, back to sunshine and high 60s today. They always say, "If you don't like the weather in Ohio, wait a few hours and it will change." It's so very true! However, signs of spring are popping up everywhere. Daffodils are blooming, the grass is a succulent green, fairy rings dot our yard, and it stays light until a little after 8:00. There is hope that spring just might be here to stay. The week began with a drive to Cincinnati to see my son's spring percussion concert at CCM. I always love going to percussion concerts. It amazes me to see all the different objects that are used as percussion instruments. Zach and his friend Danny played a prepared piano for one of the pieces. Later, Zach and two other percussionists played a beautiful piece called Meditations, which was written by a CCM graduate student. One of the instruments Zach played was the water glass. When the piece ended, my husband looked at me and said, "Remember when he used to drive us crazy playing those when he was a kid?" I was thinking the exact same thing...Zach used to line up all different kinds of glasses on the counter, fill them to different levels, and then run his finger along the rim. Who knew that one day he'd be making beautiful music? My fourth graders got to spend time with their second grade buddies on Thursday. They walked around the school yard looking for signs of spring. (We had tried to do this activity a few weeks ago and it was too blustery that day.) :) Then, we got the sidewalk chalk out and let them write poetry inspired by their spring observations. The playground was filled with poetic words and spring pictures. It was a great way to end our week. Friday was a day off for our school. My friend Kate and I drove to visit a teacher we used to work with. She retired last year, bought a fixer-upper on Hoover Reservoir, and is now enjoying her new life. We had such a wonderful time catching up over breakfast, watching the myriad of birds that visit her yard, and walking by the lake. I came home to the wonderful news that our oldest daughter, Molly, accepted a job in D.C. Yes, it's far away, but it's much closer than when she lived in California. I am so excited for her and this new adventure in her life. She has so many opportunities waiting for her. It seems like we just brought her home from the hospital and here she is all grown up ready to begin a new chapter in her life. Seeing your child be happy is one of life's greatest gifts. If you have time, take a look into her thesis project. It's all about the future of e-books and it's incredibly interesting. (And I'm not just saying that because I'm her mom). Finally, I celebrate Pretzel Salad. It's not a holiday dinner or family party if we don't have Pretzel Salad. If you haven't had it, you need to try it. We decided to stay home this Easter instead of traveling north to be with our families. The girls will be home (and I still hope Zach will decide to drive up tomorrow) and a friend will join us for dinner. This afternoon's been spent making desserts for tomorrow and Pretzel Salad. My friend hadn't heard of it before. My husband explained that there is nothing "salad" about it. I got the recipe from my mother-in-law when my husband and I first dated 30 years ago. I then introduced it to my family. It's now a staple, no matter the season. Whenever I make it, I think about our extended families and the fun times we have together. And it brings a little smile...my brother-in-law hates it and my youngest sister can't ever seem to make it right. The jello invariably drains under the pretzel crust. It's become a family joke that Susan isn't allowed to bring the Pretzel Salad. Preparing it today makes them all seem a little closer when we can't be with them in person. 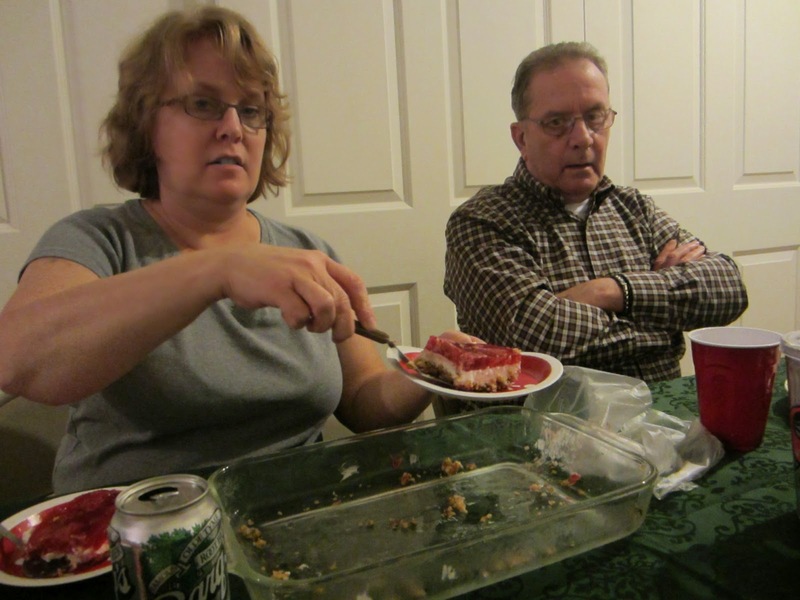 My sister Linda (who CAN make Pretzel Salad) and my dad a few Christmases ago. See the empty pan? I love pretzel salad! Not a staple at our celebrations, but I'm always glad to see it at a potluck. Spring and chalk poetry - it doesn't get better than this. Happy Easter! So many happy moments fill this post! I do love pretzel salad (especially because there is nothing salad about it). Your kids make you shine with happiness, as it should be. 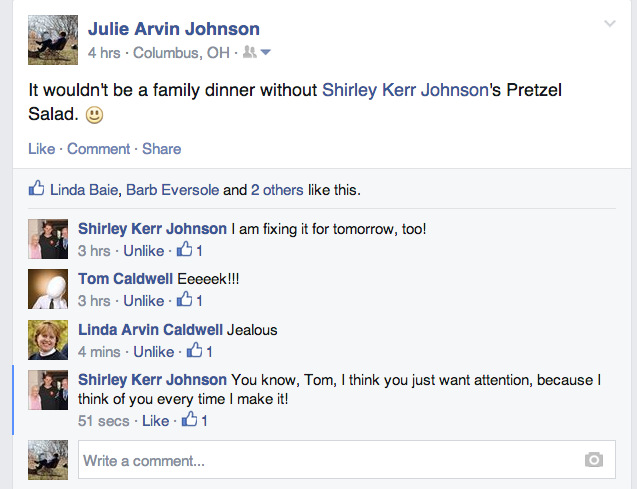 Until I saw your conversation on Facebook, I'd never heard of pretzel salad, Julie. Can you send me the recipe on FB? It sounds like you had a wonderful week, spring, your daughter being closer, family together, poetry with the students. We started with snow too-strange I agree. Happy Easter! Joyful celebrations. Congratulations to Zach and Molly. " Seeing your child be happy is one of life's greatest gifts. "- you are so right. Pretzel salad - never heard of it before. Happy Easter! What wonderful celebrations, Julie. Congrats to both Zach and Molly. You will have to keep me posted on where she decides to live in DC. My favorite thought in your post was about the power of your children being grown and happy. My favorite food from your post - pretzel salad, of course! I am with you celebrating your children's successes. I love having happy, successful adult children. Never heard of pretzel salad. Is it a northern thing? I'm sure you know of Betsy Hubbard's chalkabration every last day of the month. If not, you should link up.